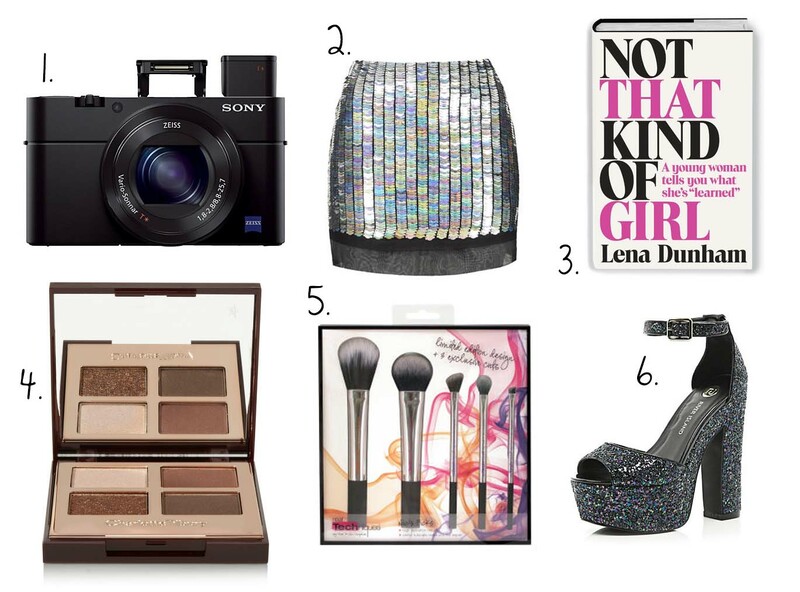 My Christmas gift guide 2014. It's December which means it's nearly Christmas and I'm finally allowed to be excited about this time of year, (I've been looking forward to it since August.) I thought I would compile a list of Christmas present inspiration whether it's for yourself, dad, boyfriend, mum or someone you have for secret Santa. I hope that my list gives you some of the answers that you've been looking for. I've popped links underneath the pictures to make it that much easier to shop. I really hope you like this post as for some reason it took me ages to put this altogether, I think I might have got distracted by all the Black Friday discounts over the weekend! I'm pretty much obsessed with everything on this list and I'm sure any girl who loves fashion & beauty would be happy to receive any of these gifts. I’m a bit of a magpie so this section list is looking very sparkly however I think it's allowed, it is Christmas. If you're feeling very generous this Christmas, I think this camera would make such a great gift for someone who loves their photography. I first spotted this camera on super-blogger The Londoner's site, if it's good enough for her then it's definitely good enough for me! However, if that's quite not in your budget then these make-up brushes from Real Techniques will make any girls Christmas. I really love the silver handles, I think they'd look great in a cute mason jar amongst all your other brushes. 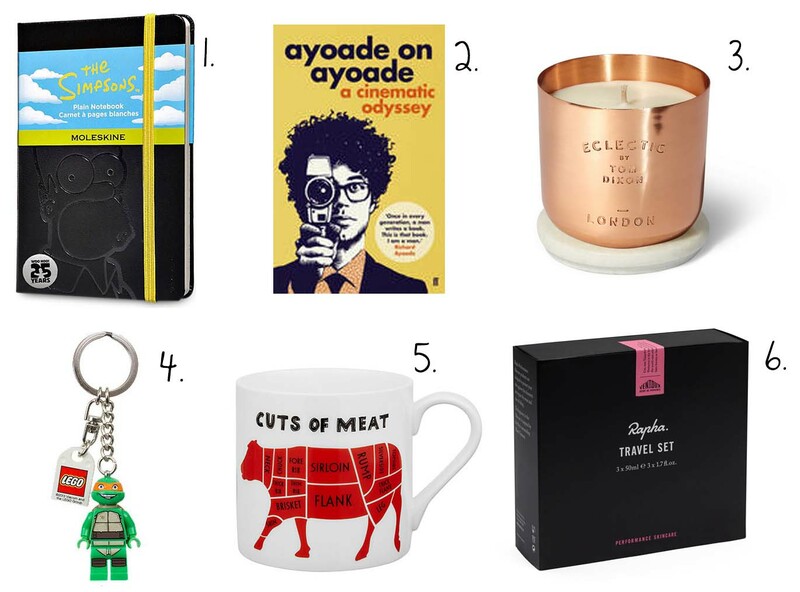 1- The Simpsons notebook, 2 - Richard adoyade book, 3 - Tom Dixon candle, 4 - Teenage Mutant Ninja Turtle keyring, 5- Mclaggan Smith mug and 6 - Rapha travel set. Despite having a dad and a boyfriend, I still find shopping for men/boys quite tricky. I often find things that I would like and then realising that I shouldn't be shopping for myself. I've tried to cater to everyone here and I think I've found a few gems. If you're looking for a cheap stocking filler then this Ninja turtle keyring from Lego is so cute and great little gesture. I have included a few pricer items including this candle. I know traditionally you wouldn't buy a man a candle but this one by Tom Dixon is pretty special, and wouldn't look out of place in any bachelor pad. My dad is a bit of a cycling nut so I know a little bit about what cyclists like. I gave him this Rapha set last year and he really loved it. I think the packaging is really stylish and I've heard the products inside aren't too bad either, so this is a must for men who are into cycling. 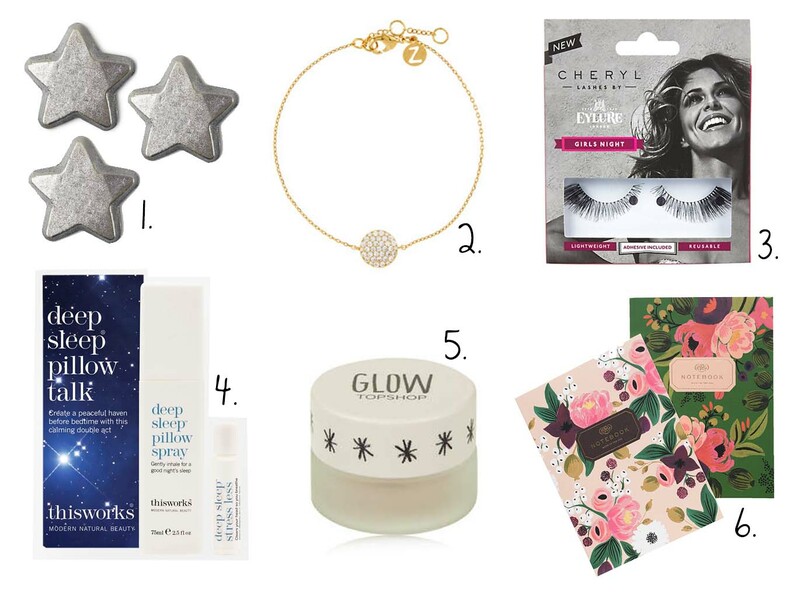 Every year you're bound to be involved with a secret Santa of some sort so I've picked some budget friendly gifts which I'm sure your recipient will love! If not these gifts would make great stocking fillers. I've tried to pick gifts that were all under £20 but the this works duo was just too much of a good offer to resist. I actually own the ring that matches this gorgeous bracelet from Accessorize and I absolutely love it, it's so sparkly and I receive so many compliments so this bracelet is sure to create a similar effect. As a bit of a make-up junkie I'm always on the hunt for the next best highlighter and I've had my eye on this Topshop one for a while. If you're friend loves make-up as much as me I'm sure this gift will be a massive hit! P.s following you :) great blog!